Is age becoming an issue for Gennady Golovkin, the 37-0-1, 33KO machine who, with a body seemingly made of iron, a mind like a chess champion, who has never been downed, never been hurt and boasts the highest knockout ratio in middleweight history? 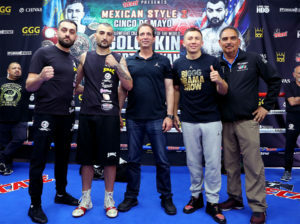 Will age be a factor as he enters the storied StubHub Center in his 20th consecutive title defense against Glendale, California’s Vanes Martirosyan 36-3-1. 21KO, also known as, given the unexpected circumstance, the fighter who is not Canelo? If trainer Abel Sanchez has done his job, the answer is probably not, and frankly, probably never. As GGG gets older, it is Sanchez’s desire to prolong his legendary fighter’s career in the ring with a mix of tactics outside the ring. I spoke with him on a recent media workout as he explained how. When asked if we can expect to see Golovkin’s hard hitting, aggressive approach in the ring change as he becomes a more mature fighter, Sanchez replied with an emphatic no. “I don’t look at his age in terms of what he can or can’t do. His style will remain basically the same. I’m trying to prolong his career as much as possible without interfering with his actual fighting style,” said Sanchez. Which is good news and bad news for future contenders to the throne. Good news is GGG won’t suddenly be adding a frustrating Mayweather type defense or Lomachencko’s blustery footwork. The bad news is Golovkin will continue to outthink you, force you in a corner, and knock you out. How much does nutrition play in keeping Golovkin’s body in top shape throughout his career? Sanchez disclosed he is not a fan of supplements and vitamins and prefers to keep nutrition in his camp basic, old school, but nonetheless clean. Sanchez ended the interview and joked that Golovkin bleeds hot salsa. Que viva el alcalde de Cinco de Mayo, GGG!